Latin-American music was playing out of a classroom during 2nd period on a Friday in Class 2 of first grade in Soseon Girls’ Middle School located in Suseong-gu, Daegu, and the students’ joyful cheers help feel the atmosphere of the free-semester-system. Deborah Ulloa, 21, who came to YU as an exchange student from Pontificia Universidad Catolica de Chile located in Santiago, Chile became a one-day teacher for Soseon Girls’ Middle School that is implementing the free-semester-system with Kwon Tae-yong (22) from YU majoring in Political Science and Diplomacy. This day, they studied topics such as popular songs in South America and the Cueca music, which is a traditional Chilen dance. Deborah Ulloa introduced Chile as a country and delivered to students the meaning and contents of music which was the topic of the class of the day, and Kwon Tae-yong conducted the class with videos related to the music and materials of lyrics in the original language. The students were very enthusiastic about the unique flow of the class conducted by a foreign college student. In particular, the students fell in love with South America and enjoyed the Chilen traditional dance together. This day, foreign exchange students from Chile and Netherlands and YU students separated into two teams and conducted classes. The classes they conducted are part of the ‘Global Harmony for Future’ Program conducted by YU and the Daegu Metropolitan Office of Education. YU and Daegu Metropolitan Office of Education designed this program to allow local teenagers to experience global culture and develop global minds while naturally communicating with foreign university students during class. 4 countries and 7 teams such as Netherlands, Chile, Brazil, and China participated in the program. 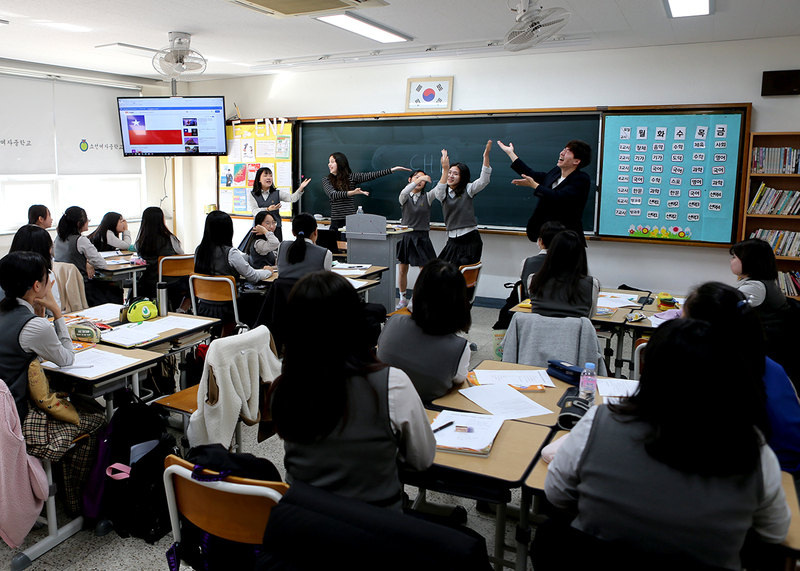 Classes will be conducted until November 23rd in 6 middle schools in Daegu including Soseon Girls’ Middle School, Gosan Middle School, Daegu Dong Middle School, Maeho Middle School, Siji Middle School, and Sinmyeong Girls’ Middle School. The topic of the classes is music from all over the world. In consultation with the Daegu Metropolitan Office of Education, YU plans on expanding the program by planning about more various topics.